1. To create a consignment SKU, first, add a vendor named Consignment. 2. Create a text attribute named Member ID. Add the attributes to desired attribute set. 3. Now you must select the customer which you wish to assign the Consignment SKU to by acquiring the unique member ID. if none of the customers have member ID set up, you can use Customer ID instead. 4. Now you can create a SKU, you must select Consignment as the vendor, and put the consignor’s member ID. 5. 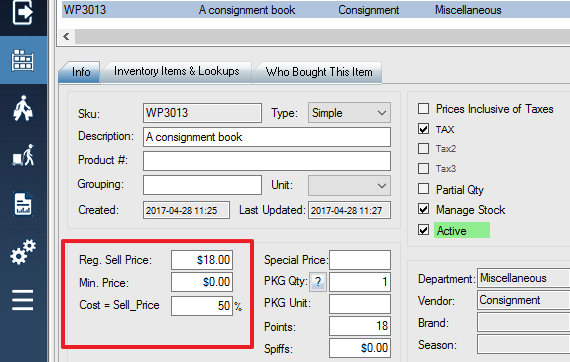 If the Consignment SKU was created successfully, your SKU information menu should change and automatically update to show Cost = Sell_Price as shown in the image below. Enter a % value to represent the percentage of the Sell Price that the consignor will receive.